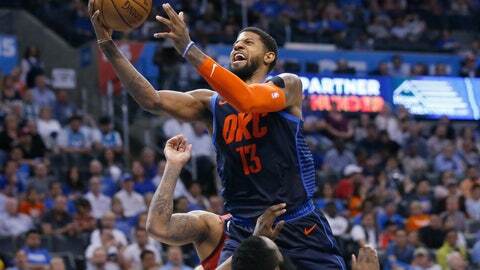 OKLAHOMA CITY (AP) — Oklahoma City’s Paul George delivered the final blow against Houston’s P.J. Tucker. George hit the game-winning 3-pointer with 1.8 seconds left, and the Thunder rallied from 14 points down in the fourth quarter to beat the Rockets 112-111 on Tuesday night. It was a physical matchup between George and Tucker, who at one point had to be separated during an altercation. George scored a hard-earned 27 points on 9-for-25 shooting. He savored the fact that he got his last bucket after Tucker failed to close out successfully on him in the corner. “All I needed was a little space, and it’s not a guy that’s got great lift, so I was able to shoot right over him,” George said. Russell Westbrook had 29 points, 12 rebounds and 10 assists for his 33rd triple-double of the season. The Thunder won their fourth straight and moved into sixth place in the Western Conference standings with one game remaining. The Thunder play at Milwaukee on Wednesday. The Bucks are expected to sit their key players. The Thunder said that wouldn’t matter. James Harden scored 39 points and Chris Paul added 24 for the Rockets, who slipped into the third spot in the conference standings in their regular-season finale after having their six-game win streak snapped. It was the kind of energy and drama that often comes with postseason basketball. Harden was ready to move on after the game. “This one is over, and now we prepare for something big,” he said. Rockets: Harden shot 4 for 11 in the first quarter and still scored 14 points. … The Rockets shot 16 3-pointers and four 2-pointers in the third quarter. … Houston made 18 of 53 3-pointers after setting the NBA record with 27 made 3s Sunday against Phoenix. … Jeff Bzdelik coached in place of Mike D’Antoni, who had been hospitalized with an intestinal virus. Thunder: C Steven Adams had nine rebounds in the first quarter and finished with 13. … Terrance Ferguson scored 16 points for his highest-scoring game since Jan. 17. … Westbrook was called for a Flagrant 1 early in the third quarter for running through Tucker. … It was the 137th triple-double of Westbrook’s career, leaving him one behind Magic Johnson for second all-time. Westbrook’s averages during Oklahoma City’s four-game win streak: 23.8 points, 12.5 rebounds, 15.3 assists.